I know, I know… when you think of meditation you instantly have visions of chanting yogis, soft spoken voices on mp3s speaking optimistic words at snail pace, and/or total unrealistic nonsense. I’m with you. For years I also thought of the same thing. While this type of mediation does work for some it’s hardly a one size fits all solution. By definition meditation simply means to spend time in quiet thought for religious purposes or relaxation. Once I got over my preconceived notions of what mediation is I realized that I, in fact, already meditate. I just didn’t consider it meditation… to be honest you’re probably already meditating in your everyday life as well whether you realize it or choose to believe it or not! Mediation is in all reality simply a state of being present and focused, while freeing your mind of all distractions. I admit the last part of that statement is better said than done, but once you realize what is meditating and how you use it in real life it’s a lot easier to consciously try to free your mind of distractions. There is no doubt in my mind that every single one of you have heard over and over just how good meditation is for your health so I’m not even going to spend time going into all of that. I will say that from my own experience meditation has saved my sanity more than once. Life is crazy busy, especially when you’re an entrepreneur, so taking a few moments to breathe, clear my head, and focus being in the moment is a must. We all need a little recharge every once in a while and doing something you love quietly or intentionally taking a slight mental break to gain a second of relaxation is highly needed and recommended. 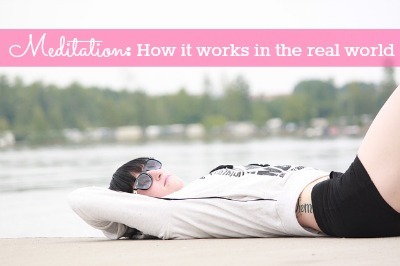 So how does meditation work in real life? It’s easy. Like I said before it’s just about being focused and in the moment. When you are completing tasks such as cooking, working out, gardening, playing Candy Crush, etc. it can actually be a form of meditating. To complete these tasks it takes being focused on what you’re doing, being in the moment, and it distracts your mind enough to take your mind off your racing thoughts. This actually gives your mind an emotional mental break because they’re mindful and purposeful tasks. Mindless tasks are also another way meditating works in the real world. Mindless tasks are fabulous because it keeps you busy but it is mindless enough that you don’t have to put great focus into it. Doing mindless tasks are actually my favorite form of meditating. My mind is always racing so traditional forms of meditating (i.e. yoga, sitting still, etc.) just don’t cut it for me because my mind instantly goes to my to-do list or problem solving mode for any issues I’m worrying about that day. When I perform mindless tasks such as knitting, crocheting, gardening, etc. my brain goes on auto-pilot which clears my mind and puts me into a relaxed mind set. One day it just sort of clicked for me that doing these things was a form of meditation because it took me into a relaxed mind set. Once it clicked for me I was able to bring awareness into these tasks to maximize the benefits. It brought self awareness to the forefront so while my brain is working to perform these tasks my mind was able to focus on being in the moment. If I find my mind wondering off to my to-do list or whatnot I simply take a moment to center my thinking. To do this I take a few deep breaths and focus on how the yarn feels in my hand or if I’m gardening I focus on how the wind or sun feels on my skin, the smell of my surroundings, etc. Another way how mediation works in the real world is sleep. If you have trouble falling asleep at night a great technique to try is meditative breathing. As you lay in bed with your eyes closed start taking mindful deep breaths. When I do this I purposely try to clear my head by repeating to myself, “Breathe in positive, breath out negative.” If that feels weird to you, you can try imagining yourself somewhere that makes you happy. For me, it’s always the beach I imagine myself sunbathing on the sand, feeling the heat of the sun, and hearing the crashing of the waves. It usually doesn’t take too long before I’ve finally drifted off to sleep. And hey, it sure as hell beats laying there thinking of everything I have to do tomorrow or trying to calculate how much sleep I’ll get if I fall asleep right now. ha ha ha I also use this same technique if I become overwhelmed or feel like I’m about to lose my cool. I simply remove myself from the situation, close my eyes and either use the breathing technique or imagine I was on the beach. For me at least I found the breathing technique helps best when I’m about to lose my cool. How do you use meditation in your everyday life?